A colleague of mine made the off-hand comment the other day, “Aw, who wants to read about camels? !” (We were talking about plagiarism. You figure it out.) Oh, yeah? I thought. 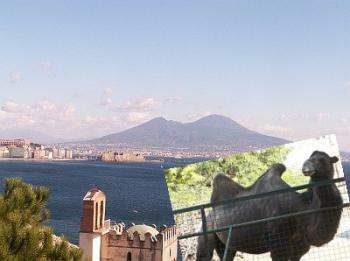 I bet I can relate camels to Naples. After all, there are some camels in the Naples zoo, and bits and pieces of camel bones from the Greek city of Neapolis have even been found (see Bökönyi, below). It sounded easy. Everyone knows that the Romans knew about camels. They even brought back camels from the far-flung reaches of the empire and raced them in games in the Colosseum. I googled "camels in Italy" and—bingo!— actually got “How many camels are there in Italy?” It was too good to be true. No, really. It was a hoax —or at least a psychology study (which is damned near the same thing). The question was the title of an article in the journal, Neurological Sciences, on how we figure out the answers to questions that are not immediately answerable but that can be effectively guessed using general knowledge. Other questions included “How many eyelashes do we have on our lower eyelid?” and “How high is a traffic light?” The questions all had real answers as well as the answers provided by 175 subjects. Abnormally high or low estimates were considered bizarre and meant that you had something wrong with you, but I don't know what. The correct answer to the eye-lash question was 60; traffic lights are 3 meters high; and there are 40 camels in Italy (the estimates ranged as high as 400). Plan B. The Arabs ruled Sicily in the 10th century. Did they import camels from Africa? Of course. Did any of the animals find their way onto the mainland? Yes. How? In the year 1061, in a valley near Cerami on the island of Sicily, the Norman ruler, Roger, with a band of a few hundred soldiers, defeated an overwhelmingly superior Arab force in a battle that was decisive in bringing Sicily back into Europe and stemming the northern push of Islam into Italy. That battle remains relatively unheralded, but it was as important as the earlier Battle of Tours in France in 732, which stemmed the advance of Islam in that part of Europe. To help celebrate, Roger then sent four of his adversaries' camels as a present to Pope Alexander II. Roger kept and used the rest. Even today, near Messina the figure of the camel crops up in various folk rituals that celebrate that Norman victory. Later, Ferdinand II de Medici (1610-1670) kept some camels near Pisa. They were a gift of the bey of Tunisia, and shortly thereafter, in 1683, more camels wound up in Italy as a result of the victory over the Ottoman Turks at the Battle of Vienna. In 1692 the Medicis then started to raise camels in the Mugello, an area of Tuscany. By the mid-1700s there was a herd of 200 camels at San Rossore (near Pisa, and as late as the early 1900s there was still a small herd of camels in San Rossore. The last one died in 1976. The Roger who sent the camels to the pope was the first consolidator of Norman holdings in southern Italy and the father of Roger II, the first ruler of the Kingdom of Sicily, later to be known as the Kingdom of Two Sicilies or the Kingdom of Naples. Bökönyi, S. (1974) History of Domestic Mammals in Central and Eastern Europe. Budapest. de Grossi Mazzorin, J. (2006) "Cammelli nell’antichità: le presenze in Italia" in Archaeozoological studies in honour of Alfredo Riedel. Bolzano. Fascetti, G.R. (1991) I cammelli di San Rossore, Pisa, Giardini, 1991.